ITU News Magazine is ITU’s free digital magazine, published exclusively online since 2016. It is a key source for in-depth coverage of ITU events and initiatives as well as insight on global information and communication technology (ICT) trends. The History of ITU Portal is a gateway to a wealth of information about the International Telecommunication Union’s history. Visit the History of ITU Portal to learn more about ITU by exploring the growing selection of digitized documents, as well as a number of articles, lists, and other interesting resources that illustrate the Union’s long and illustrious history. Starting in the 1960s, a number of specialized publications were regularly circulated to the telecommunications community in the form of supplements to the Telecommunication Journal / ITU News. For ease of reference, the following supplements have been removed from the journal issues and are presented as separate collections on the History of ITU Portal. These tables were prepared using information provided by telecommunication administrations of ITU Member States, the Committee on Space Research (COSPAR), national space research organizations, the International Frequency Registration Board (IFRB) and later the Radiocommunication Bureau (BR) of the ITU, and from details published in the specialized press. This annual report summarized ITU’s main activities in the field of outer space since the previous report. In addition, information supplied by ITU Member States on the progress they had made in the development of space communications was included in an annex. 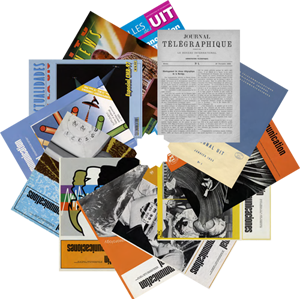 This collection brings together the series of information booklets that ITU published from 1965 to 1996. The booklets explore a wide range of topics related to ITU’s areas of work and activities during this period.